In major emergencies and disasters, the international community often mobilizes to deliver technical assistance as well as in-kind and financial resources to the affected country. However, if this support is massive and arrives suddenly, it can further complicate emergency conditions if there is no coordination structure in place to manage it. International assistance should respond to explicit requests made by the affected country, based on its assessment of damage and needs. It should meet the needs that are most difficult for the country to meet with its own resources and should be closely coordinated with the national authorities in charge. In all cases, the local community or region provides the immediate response to a disaster. With that in mind, international assistance should target those specific needs and technical problems that the affected country’s available resources are inadequate to address. Emergencies of a certain magnitude involve a great number of humanitarian actors—actors already present in the country and/or actors coming from abroad to provide assistance. Under the United Nations Secretariat, OCHA is responsible for bringing together humanitarian actors to ensure a coherent response to emergencies. OCHA mobilizes and coordinates effective and principled humanitarian action, in partnership with national and international actors and promotes preparedness and prevention. It also coordinates specialized teams that are sent when governments of countries affected by a disaster so request. 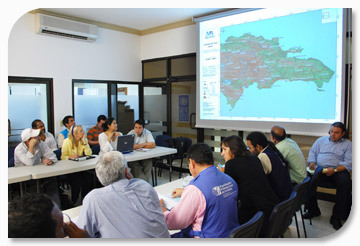 To improve the efficiency and the effectiveness of humanitarian response to crises and increase the capacity of the principal humanitarian response sectors, the Interagency Standing Committee (IASC), as a coordination entity that includes the agencies of the United Nations System and other international organizations active in humanitarian assistance, established the thematic cluster system.